Carrying Walther P22 - What Is The Best Holster? Home Reviews Carrying Walther P22 – What Is The Best Holster? Carrying Walther P22 – What Is The Best Holster? Finding the right holster for your Walther P22 can take some time and research. You need to keep in mind that it is just as important to find the right holster as it is to find the right handgun. Price shouldn’t be your only consideration, you should also think about how easy it is to access your gun quickly and how safe the gun is from others who may try to take it from you. How you plan to carry it is one of the biggest considerations of all since certain holsters are better for different situation, so make sure you consider all these questions as you are choosing the right holster for you and your needs. Our top pick is the Fobus Standard Holster RH Paddle that features space-age plastics and injection molding techniques that make you feel like it came straight out of the future. 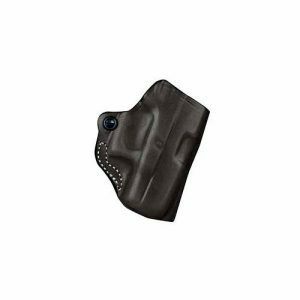 This is durable outside the waistband holster that can withstand the toughest elements, and it uses a rubberized paddle to attach to your clothes. The Fobus Standard Holster is easy to maintain and is highly concealable when worn high and close to your body. This holster is specifically made for the Walther P22, so it fits snugly and has great pistol retention. The Walther P22 is a semi-automatic pistol that is manufactured by Walther Arms and introduced in 2002. It holds .22 LR rimfire ammunition and features a magazine disconnect that keeps the trigger from working unless you have the magazine inserted and locked into the handgun. Similar to the Walther P99, the P22 falls into the small to medium size gun category. Since it is on the small side, the Walther P22 can use a wide selection of holsters including ankle holsters, over the waistband holsters, pocket holsters, inside the waistband holsters, and shoulder holsters. Popular with civilians that are interested in learning self-defense, the Walther P22 has become a common choice for those interested in wear a concealed weapon. This is especially true for those that live where the law requires gun owners to wear their weapon concealed at all times. With a small like the Walther P22, it is easy to conceal using almost any type of holster. Small guns often use ankle holsters to carry them, but this type of holster can slow your draw speed since you need to bend down to retrieve your weapon. If you want a faster draw, look for pocket holsters, IWB holsters, or OWB holsters. The P22 is a pretty popular weapon to carry concealed due to its small size. Most often, the type of popular concealed carry holster that is chosen for this size handgun is an OWB or IWB. How long will I be carrying my handgun during the day? Will I be practicing open carry or concealed carry? How quickly will I need access to my firearm? How often will I be in situations where I will need to protect myself? When you know the answers to these questions, you will have an easier time deciding how you would like to carry your handgun and how you intend on using it. Pocket Holsters – With the increase in popularity of compact handguns, pocket carry holsters became a viable option. Most commonly you use your pocket holsters in your front pants pocket or jacket pocket. It is a convenient way to carry your handgun, but remember that you should never carry your handgun without a proper holster which will secure your gun and protect the trigger for safety reasons. 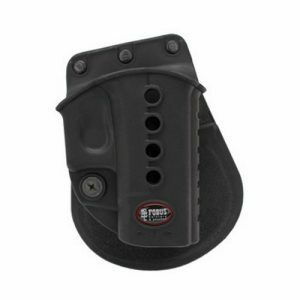 Standard Belt Holster – With an adjustable standard belt holster, you will have the best position for your weapon in the event you are in a fast draw situation. Since it is level with your hand, the standard belt holster places your weapon on your thigh for easy access. Standard belt holsters are a popular choice for those that choose open carry and for military and law enforcement officials. Crossdraw Shoulder Holsters – This is a holster that you should only consider if you are careful when you draw as you do not want to accidentally fire your handgun when it is pointed behind you as you pull it out. The crossdraw shoulder holster will require some practice time before you are successful at it and you will often find the magazine pouch on the harness’ side. Belt Worn Holsters – If you want a secure and safe holster, the belt worn holster has a place for you to slide your belt through. You will have quick access to your pistol, and your weapon will be aimed downward until you pull it out of the holster. Even though you do have fast access to your handgun, you may find that it snags on the chair when you sit and, in some cases, you may have to take it off. Paddle Holsters – Like a belt worn holster, one of the benefits of a paddle holster is that you can take it off without having to take off part of your belt. If you wear a paddle holster, you will need to make sure your belt is tight enough so that you won’t pull your holster and your fun out together when you draw. If you wear a good belt that is wide, that should help avoid that problem. Inside the Pants Holsters – Commonly used for concealed weapons, the inside the pants holster can be worn under an untucked shirt or with your jacket. You don’t need any belt loop position for this type of holster so you can decide on where you prefer to wear it. With an almost futuristic design, the Fobus Standard Holster is constructed with space age high-density plastics and injection molding making it durable enough to withstand even the most severe elements. This is a right handed, outside the waistband (OWB) holster that uses a rubberized paddle to attach to your clothes. This is also a no maintenance holster that doesn’t require sweating or breathing. With a unique passive retention system, you are guaranteed a pistol that will be retained in the holster securely and will only come out of the holster when you need it. It has no sharp edges, so this soft and compliant paddle holster rests very comfortably on your hip. The Fobus Standard Holster is also highly concealable when you wear it high and close to your body. The Walther P22 fits snugly into the Fobus Standard Holster since it is designed specifically for this pistol. 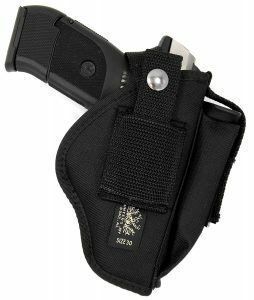 It also has great safety features including a completely covered trigger that prevents any accidental discharges, a secure paddle attachment, and strong integral snap slides that attach to your belt that keep attackers from unclipping your holster. The Fobus also features great pistol retention, because once your handgun is in the holster, it cannot be removed with an angular pull, only you can remove it with a straight up draw. It also has a solid lock, so it will take a little practice before you can remove it safely, quickly, and smoothly. Made from reinforced saddle leather, the Tagua Gunleather Holster is an inside the waistband (IWB) holster for right handed shooters. With an open muzzle design, the Tagua IWB Holster features a combat grip, great retention, and a high-quality clip that is easy to attach. If you are looking for an easily concealable holster, this is one of the better concealable Walther P22 holsters on the market. You will feel comfortable wearing it with a t-shirt and shorts, it is that concealable, however, it may dig in a little bit when you sit down which is normal for most IWB designs. The Walther P22 fits this holster well, but it does need a period of time to break in. After it is broken in, it has a smooth and fast draw while still securely retaining your handgun when you aren’t using it. 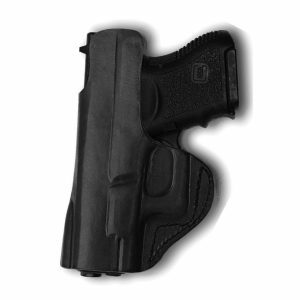 This is an affordably priced IWB holster, especially since it is constructed out of leather. One of the more compact Walther P22 holsters on the market, the Desantis Mini Scabbard Holster is constructed of leather and has an OWB design with a great grip and retention since it molds perfectly to your pistol. Not only does this bare essentials holster fits well within your budget, but is comfortable to wear with its minimalistic design, although it does tend to be a little tight when it is new like any leather holster. The Desantis Mini Scabbard Holster can accommodate up to 1 and a half inches belt slots, and it is one of the more concealable Walther P22 OWB holsters on the market. You will need to break this holster in like most other leather holsters, but once you have finished you will have unmatched retention with a great adjustable tension device that allows you to reach just the right balance from retention to smooth draw. One of the more inexpensive holsters on the market, the USA Made Deluxe Belt & Clip-On Side Holster comes equipped with several features. This is an OWB holster constructed of durable denier Cordura nylon with a soft lining on the inside of the holster to protect your handgun. The USA Made Deluxe Belt & Clip On also comes equipped with a tempered spring steel clip, an adjustable thumb snap strap, and web loops that allow you to accommodate belts with up to 2 inches on either side. It also includes an extra front pouch that lets you carry an additional magazine with you. The USA Made Deluxe Belt & Clip On also has great attention to detail that includes edges that are turned under to prevent fraying and a smooth draw with the inside sight channel. Your Walther P22 will fit snugly into the comfortable USA Made Deluxe Belt & Clip-On and it is a great, inexpensive holster to use outdoors or on the range. Finding the right holster is very important since you want a holster that your firearm will fit securely as well as give you fast access to when you find yourself in a dangerous situation. It is always helpful to read reviews from other owners and do your research so that you can find a holster that will not only fit your handgun but also how you plan to use it.